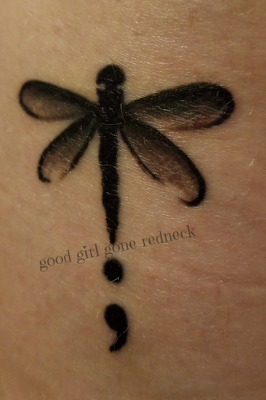 Good Girl Gone Redneck: Ink. It's no secret that Jewish people aren't supposed to get tattoos. I thought that I would observe that. Follow that belief. Law? Tradition. Rule? I thought I'd adhere to it for my entire life. And yet, I sometimes thought, what would I get if I ever DID change my mind? What would I do - what sort of marking would I want on my body for-permanently-ever? That's what I said to myself. I felt stronger for them. I decided that I wanted to mark the moment. I wrote about this before. I've written about another way of being marked before. On the day she was born. And so. I write again. On the day I became a mom. The dragonfly symbolizes change, transformation, adaptability, and self-realization. It stands for wisdom, power, courage, energy, and magic. Soaring above all others with strength, joy, and bravery. 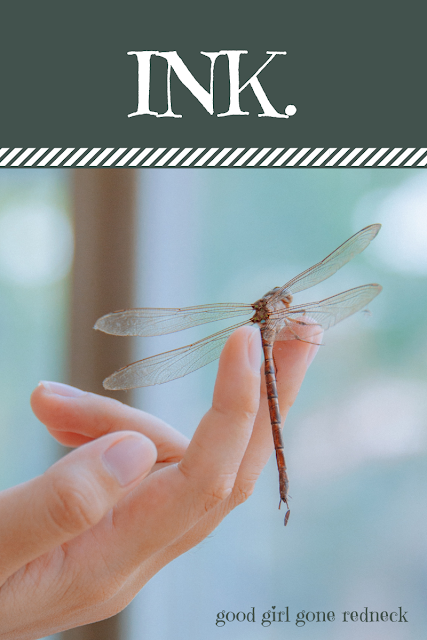 The dragonfly is also considered a symbol of good luck and represents positively embracing change for its freeing qualities. Permission to change as you grow. I love that. When things are done with good intent, with positive meaning, and it does no harm, it is your choice to make without judgement.